While Mortal Kombat 11 continues to roll out new characters, last weekend's closed beta offered the opportunity to go hands-on with a handful of characters that have already been revealed. Shacknews spent a good chunk of the weekend playing around with some of the game's most colorful characters, including the fearsome Tarkatan warrior, Baraka. 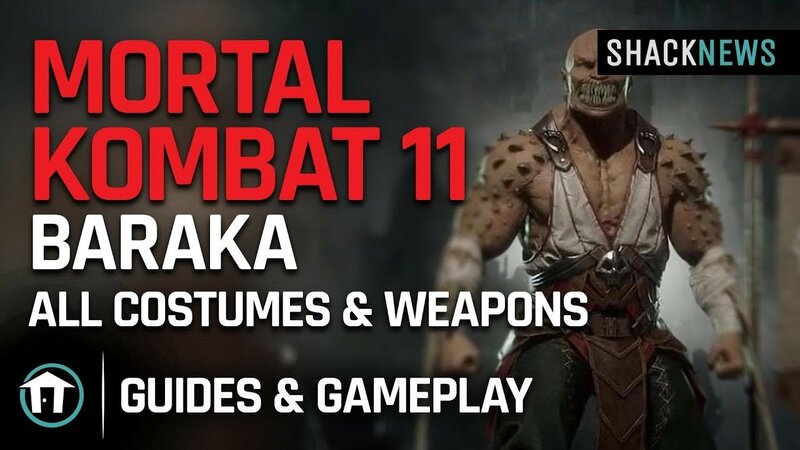 The video above offers a good look at what Baraka has to offer. This includes the different items, weapons, and "kosmetics" that players can equip when using the mighty long-toothed grappler. Players can change around what types of Arm Blades, Head Gears, and War Banners that Baraka can take into each fight, attaching different ones to each of his variations. Look like a true badass by carrying a flag with the Mortal Kombat logo into the arena. Those looking to see what Baraka can actually do on the battlefield can watch our own Chris Jarrard in action. He took Baraka, among the other five playable characters in the beta, into the fight in our online beta gameplay video from earlier today. It should be noted that Baraka is quite different from previous incarnations of his character, so recognize when it's time to lay his banner down and, more importantly, get an idea of what the banner does. Lord knows I didn't when I jumped in with Baraka way back at the Mortal Kombat 11 reveal event. You'll want to check out more videos like this leading up to Mortal Kombat 11's release date, which is just weeks away. For those videos, along with gameplay video of the latest big releases, be sure to follow Shacknews on YouTube. You'll also want to subscribe to GamerHub.TV for all of our latest developer interviews. Mortal Kombat 11 releases on April 23 on PC, PlayStation 4, Xbox One, and Nintendo Switch.